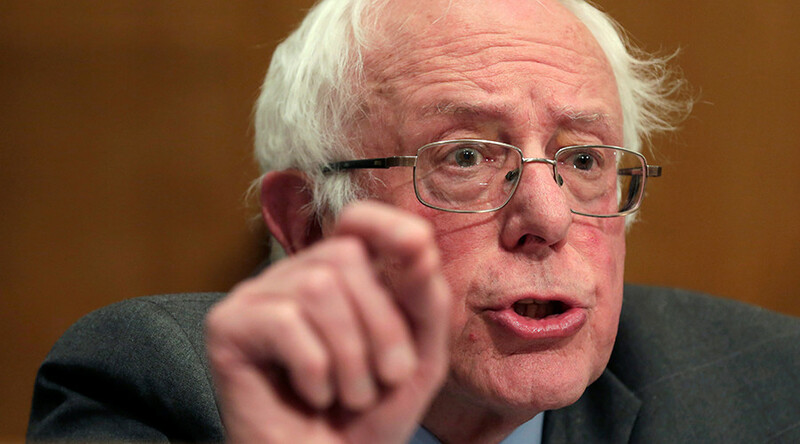 Former Democrat presidential candidate Bernie Sanders has attacked US President Donald Trump for rowing back on his campaign rhetoric by appointing Wall Street bankers to powerful positions. "It is hard not to laugh, to see President Trump alongside these Wall Street guys. I have to say this, Jake, and I don't mean to be disrespectful, this guy is a fraud," the 75-year-old Vermont senator told CNN’s Jake Tapper on Sunday. Sanders said that Trump promised during the campaign that he would not cut Social Security, Medicare and Medicaid but "then he appoints all of these guys who are precisely going to cut Social Security, Medicare and Medicaid." "You have a president who, I think, in a totally fraudulent campaign said, 'I'm going to stand up for the working people.' Look at his Cabinet, we never had more billionaires in a Cabinet in the history of this country. Look at his appointees," Sanders said. "These are people who are going to go after the needs of working families, the elderly, the children, the sick, and the poor. That is called hypocrisy." Sanders, who has consistently called for greater regulation over Wall Street, criticized Trump for appointing billionaires to his Cabinet and for appointing people who come from Goldman Sachs. Trump picked Steve Mnuchin for Treasury Secretary and Gary Cohn to lead the National Economic Council. Both men are formerly of Goldman Sachs. He also selected billionaire former banker Wilbur Ross to head the Commerce Department. "I think he is going to sell out the middle class and the working class of this country," Sanders said. "He told us, in fact, it's in the Republican platform, he's going to bring back Glass-Steagall, we're going to be dividing up commercial banks from investment banks to insurance companies. Then he has all of the big Wall Street guys on his side, and now he is working for Wall Street." Sanders called on Republicans to "have the courage to stand up to Trump's movement towards authoritarianism." The Vermont senator also weighed in on Trump’s nomination of Neil Gorsuch to the Supreme Court. "I want a Supreme Court that is going to stand up for civil liberties, for constitutional rights, for the rights of workers, for environmental rights, for the rights of women," Sanders said.